the Dog means a lot in a person's life. This is one of the oldest of his companions. Not surprisingly, art animals were often portrayed as in the paintings and in sculpture. Artists simply could not exclude this way of life. Pictures with dogs were performed in different styles, in the literal and metaphorical sense. Paintings of them hang in museums, are the subjects of private collections. 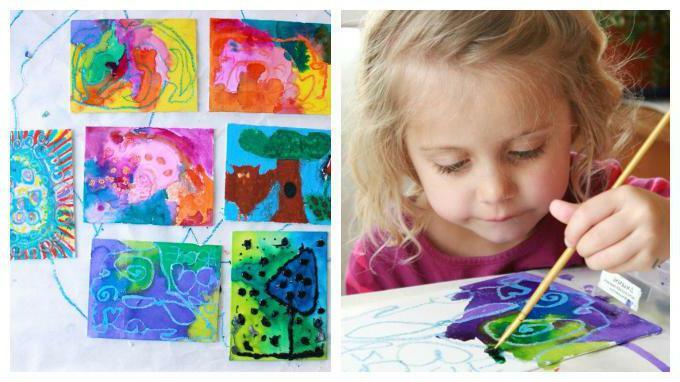 Read more about some of the works you can learn from this article. the Artist worked in a time when it became popular to depict scenes of domestic life. The rapidly growing middle class prefer to see something more familiar. Special attention was paid to stories where the main characters were little children. Most often in the paintings they are depicted in the game with Pets. Among other artists working in this direction, the most famous was Arthur John elsy. His work portrayed a quiet, cute and warm scenes and during the life of the Creator has gained huge popularity. Painting entitled “Goodnight” filled with home comfort and joy. It depicts a little girl in a nightgown, which mother or nanny leads to the bed. 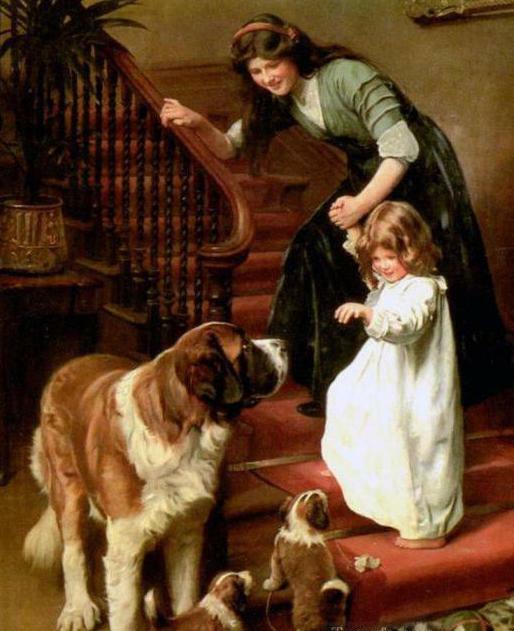 Goodbye baby waving a big dog of breed St. Bernard and two little puppies. Here are closely touching the life of man and animal. Adult dog quietly looks at the passing of a child, and puppies not yet quite departed from the previous game. They probably also will soon go to sleep. Another picture with the dogs on a realistic theme. The name “shrink”. Here the dog is the main character of the film, but is its integral part. All the characters of the canvas are disappointed that boy again came home with a bad grade, but only the dog is genuinely glad to see his friend. Her no matter how well a child learns, because she waited all day for his return. Faithful four-legged friend will share with a boy as funny moments of games, and severe punishment. 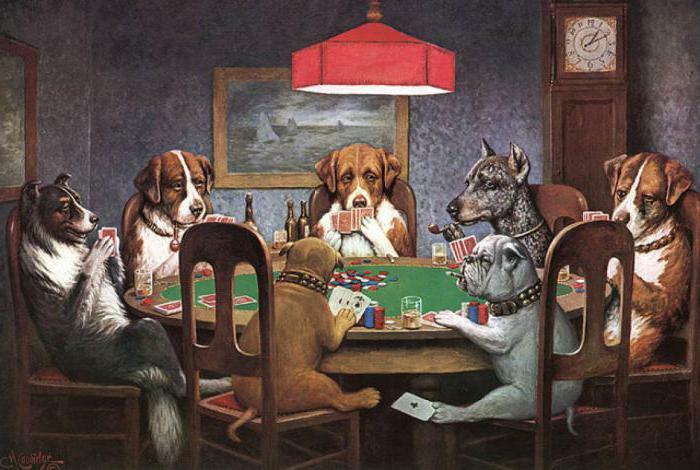 it is Impossible to talk about the paintings about dogs and not to remember one of the most famous paintings – “Dogs playing poker". Its author Cassius Coolidge was a popular cartoonist. One of the subjects in his performance – dog, which is depicted in “human” situations. Together, these paintings form the series of 16 paintings. They brought the artist fame. The paintings were written in the order of the advertising Agency Brown & Bigelow, who needed illustrations for a calendar of one cigar company. No specific requirements and restrictions in the story didn't move forward, so Coolidge embodied a bold and original idea – presented familiar situations from people's lives, but with one significant difference – heroes were made by dogs of various breeds. In one of the illustrations of the little bulldogs playing poker against “serious” of rivals. Those keep themselves grandly, but all the time defeated, but two small rival cheat and rip off a large sum. Two paintings “a Bold bluff” and “Waterloo” show one scene. At first, the St. Bernard of the bluff wants to get all the winnings, and the second his partners in the game are outraged that succumbed, and the cards in St. Bernard was not large. a Favorite pastime of the aristocracy of the 18th-19th centuries was hunting. 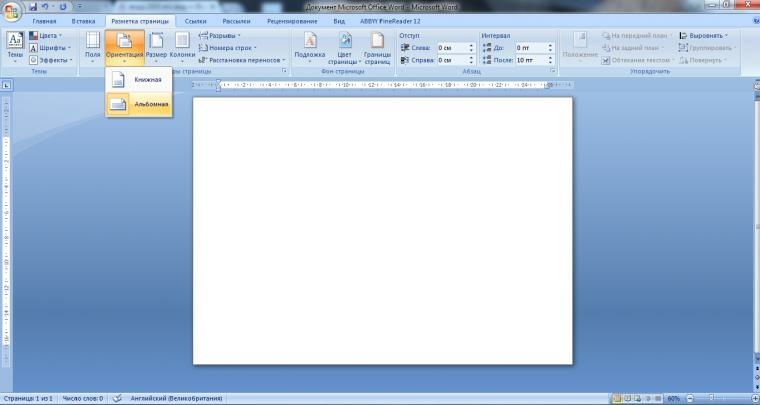 This hobby became popular in Russia and abroad. 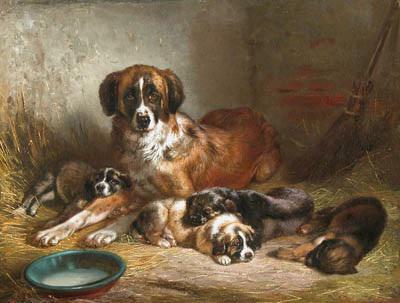 One of the artists that wrote a lot hunting pictures with the dogs, was Thomas An. His work was often exhibited at the gallery of the Royal society of great Britain, and also in the Academy. 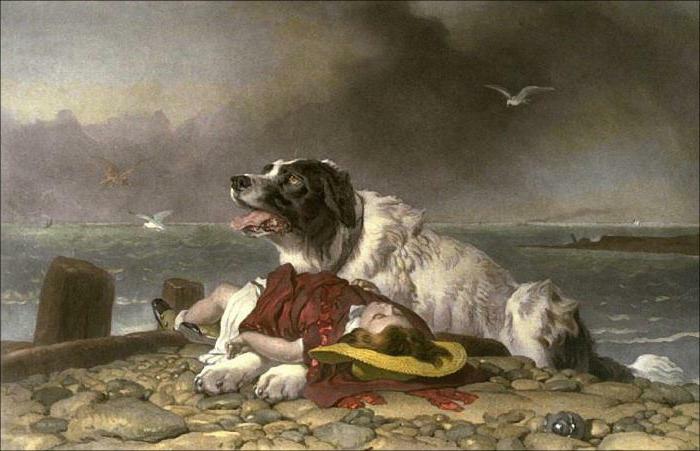 The artist was distinguished by the skill of the image of hunting dogs during the chase, vacation. pictures of Blinks very accurately convey the beauty of nature, the excitement that arises during the pursuit of prey, the tension of both animals and people. a British artist, who often did the animal heroes of his paintings. Portrayed as wild animals and Pets. World have a lot of pictures with the dogs. One of them is called “dressed”. In it we see a young lady in a lovely dress that is dreamily looking into the distance. It is surrounded by three dogs of different breeds. The smallest of them, the lady is holding. Everything here is simple and easy. Felt changes in the art, when the needs of the audience started to dictate to the artists what should be depicted in the paintings, if they want to sell it. It is one of the most famous painters of the Victorian era, a favourite author of Queen Victoria. He was also a great sculptor. His lions that adorn Trafalgar square, have become a real symbol of this place. In the 19th century, scientists were increasingly interested in the presence of intelligence in animals. That is why in their works of Landseer depicts dogs in a state of strong emotions, giving the outline of the similarity with humans. On his canvases the artist often wrote the exact same breed of dog. Later this variety of Newfoundland was named Landseer. 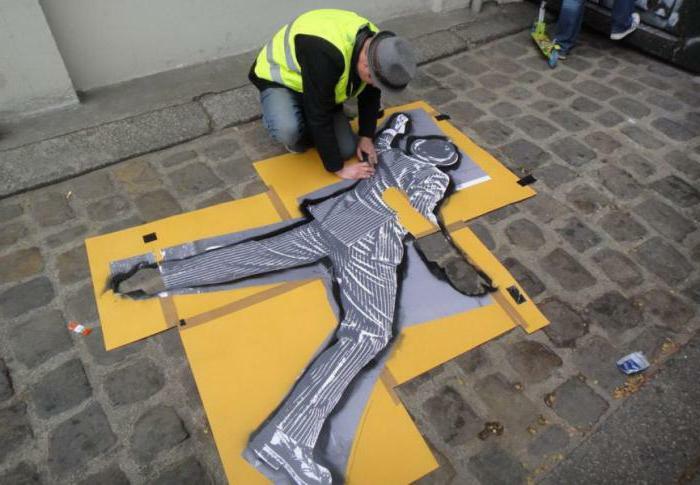 For example, the picture of the “Saved”. The dog pulled from the water a girl who is unconscious. Animal emaciated and terrified that the child might not Wake up. The dog looks imploringly up, similar to how we sometimes look at the sky in difficult times and ask for help. Not only British artists had a passion for animals. 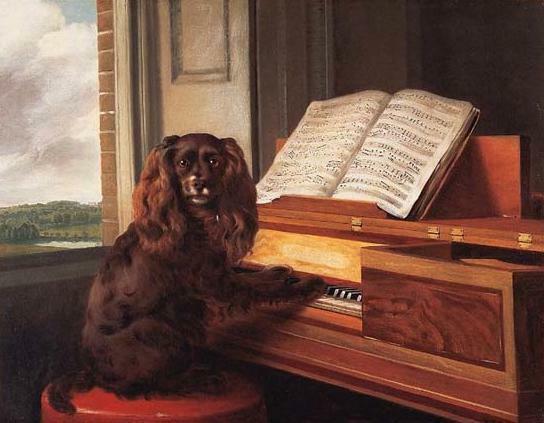 One of the famous paintings with dogs was painted by the Scottish painter Philip Rangel and it is called “Portrait of an unusual musical dog”. it depicts a four-legged performer with a very serious and concentrated face. The impression, as if the painter has distracted him from an important rehearsal or songwriting process, his request a little pose. Rangel skillfully accents: after all, the dog's coat dark chocolate color, and only a few spots on the face allow to clearly distinguish features of the animal. This artist has created a special painting of a dog with puppies. In the barn or in the hayloft, where she plays the place the mother with her babies resting away from the bustle and noise. It seems like she's looking at the viewer warily, allowing him close enough, but still ready, if necessary, to protect the offspring. Puppies, martvilis enough and hearty eating, located next to a mom and lazily dozing. Of interest is the color gamut of the picture: the combination of red, brown and black tones are enhanced by sunlight filtering into the room. unlike the previous artists, B. Adam gives the face or eyes of the animal the resemblance to human. He's the dog depicted are real, but no less beautiful. a Photo of the painting with a dog of this artist it is easy to find online. 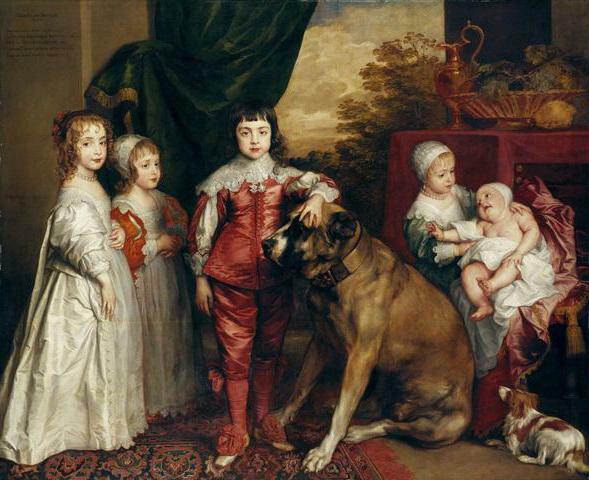 Van Dyck is well-known not one canvas. His mastery is evident not only in the stunning technique, but also the intricacies of the composition. In the center of the painting sits a huge dog breed Mastiff. We see that this faithful and loyal family friend. However, his hair is depicted so that, despite the impressive size, the viewer's gaze briefly lingers on the animal. Where greater interest is the young Prince's face. The color of his suit contrasts with the dog, and his eyes rivet the attention. After seeing all the other children, we are watching the hand of the child, pointing to the animal, and then come back to it. Painting dogs playing an important role in the development of art. With their help, the artists were able to bring the atmosphere of warmth and coziness, well-being and prosperity, of movement and speed. No wonder these animals are so long coming with us next.